It’s 2019 and we hope to be covering more sports featuring Asian athletes. The 2019 Seattle Mariners will look much different than last year’s team, which came close to making the playoffs. The team traded away or did not sign a lot of its stars we have come to know over the past couple years, including James Paxton, Robinson Cano, Edwin Diaz, and Nelson Cruz. The Mariners have adopted a strategy of attempting to trade away stars with heavy contracts in favor of younger, promising talent. The only problem with this is that it ensures the team will be taking a step back from winning and a shot at the playoffs. On New Year’s Eve, Mariners fans were given a glimmer of hope, or at least someone to watch next season, as the team reached a deal with Yusei Kikuchi. The 27-year-old left-handed pitcher looks to be the central focus of a pitching group looking for a leader after Paxton was traded to the New York Yankees. Kikuchi played 8 seasons in Japan for the Seibu Lions, where he was the 2017 runner-up for the Sawamura Award, the Japanese equivalent to the Major League Baseball’s Cy Young Award, the distinction going to the league’s best pitcher. With the Mariners predicted to not compete for the playoffs in the next two years, Kikuchi seems like a pitcher that Seattle will look to grow with and possibly be a player to promote. Kikuchi is not projected as high of a prospect as last year’s Shohei Ohtani, whom the M’s courted. He eventually chose the Los Angeles Angels instead of Seattle. Yet, Kikuchi could turn out to be a solid pitcher like Hisashi Iwakuma. At his introductory press conference, Kikuchi spoke in English to the assembled media, a rarity with past Japanese stars playing for the Mariners. 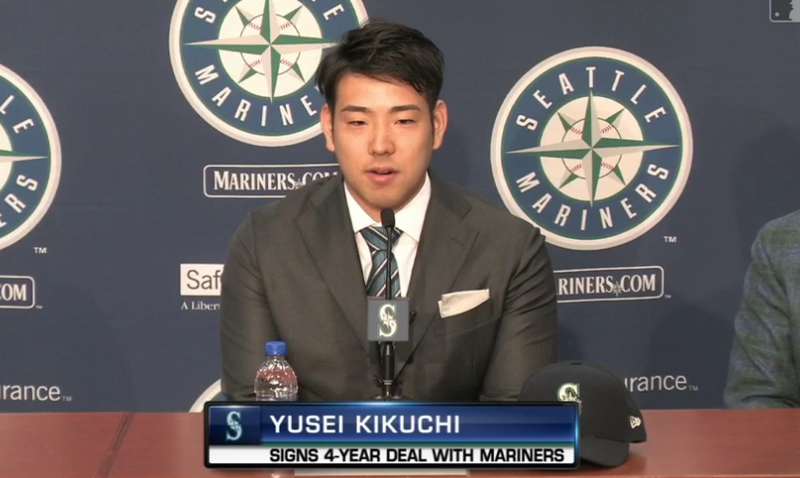 “Hi everyone, my name is Yusei Kikuchi of the Seattle Mariners,” he said, starting off the press conference. Kikuchi had worked on his English and although he had an interpreter there to translate questions, it was clear he understood what was being said. He explained that he dreamed of playing in Major League Baseball since he was 15 years old, and he thanked his Japanese team for allowing him to come to America to play. Kikuchi signed a four-year contract with an option to extend to seven years. If nothing else, he is someone to watch during a season projected to be a downer. When Rui Hachimura got to Spokane, Wash. to play college basketball for Gonzaga, he did not speak much English. His mother is Japanese and his father is from Benin. He grew up in Japan playing basketball and baseball. In April 2015, he signed on to play for Gonzaga and was considered one of the best international players to go play in college. He became just the fifth Japanese-born male to play NCAA Men’s Basketball. Hachimura adapted with the help of his teammates. He figured out American slang with the help of rap lyrics from songs played in the locker room. In classes, he learned to play charades with his professors to communicate. Yet, he had trouble with the language barrier, when coaches tried to communicate offensive plays and defensive strategies, which presented a big hurdle. He did not play in the 2017 National Championship Game when the Bulldogs played North Carolina. Gonzaga fell to the Tar Heels that day. As a result, Hachimura made a diligent effort to learn English. He attempted to speak English at every chance, waiving off the opportunities to speak in his native language. He also used Netflix as an unofficial way to learn the English language. After his first year at Gonzaga, Hachimura transformed from a reserved person of few words to being more outgoing, as he gained confidence in his English. The newfound confidence translated to more time on the court, where he showed his ability. Hachimura has been a breakout star this season and figures to be a top pick in this June’s NBA Draft. If picked this spring, he would be one of a handful of Japanese players to play in the NBA and the only one to be drafted by an NBA team. His best performance this season came when Gonzaga defeated then #1 team in the nation, Duke, at the Maui Invitational in Hawaii last November. Hachimura was the top performer in one of the biggest games of the young season and overshadowed a Duke team sprinkled with other projected top NBA draft prospects. He scored 20 points and grabbed 7 rebounds, as the Bulldogs beat the Blue Devils 89-87. In early December, Hachimura sunk a last-minute jumper to end a University of Washington upset bid at Gonzaga, 81-79. Hachimura is the central figure of Gonzaga’s offense, as he’s averaging 21 points a game. Since his troubled freshman year where he averaged just 4 minutes a game, Hachimura is averaging 30 as a junior. After playing for the Zags this season, and likely declaring to forego his last season to play in the NBA, Hachimura has more basketball to play. He is a part of the Japanese national team, as it attempts to make a bid to qualify for the 2020 Summer Olympics, which will take place in Tokyo.